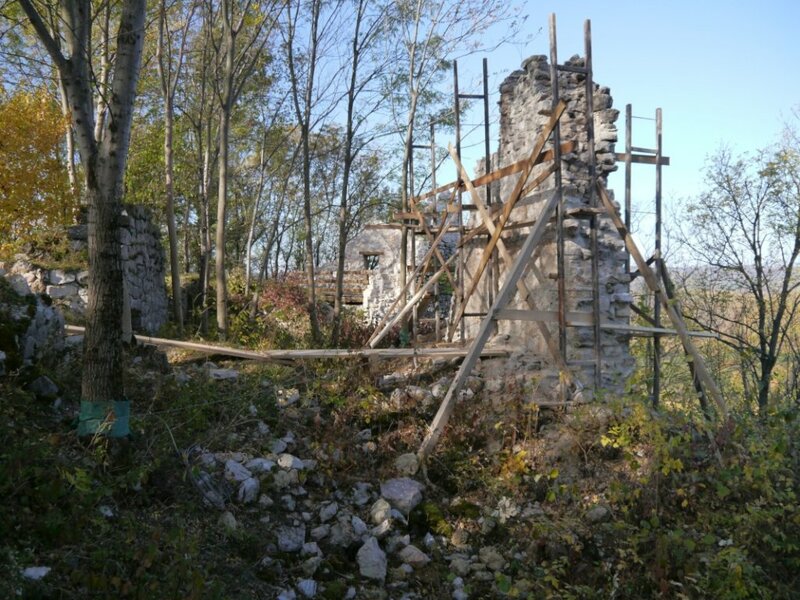 Let me proudly inform you about the finish of the latest conservation works in Szadvar. There are a few parts of the castle walls which are still standing tall, at some points more than 12 meters (40 feet) above the ground. Those might have been higher or stronger structures originally or were defended by the forest more effectively. Anyway, despite the 330 years of ruination they remained the witnesses of the late castle holding essential information about the building. 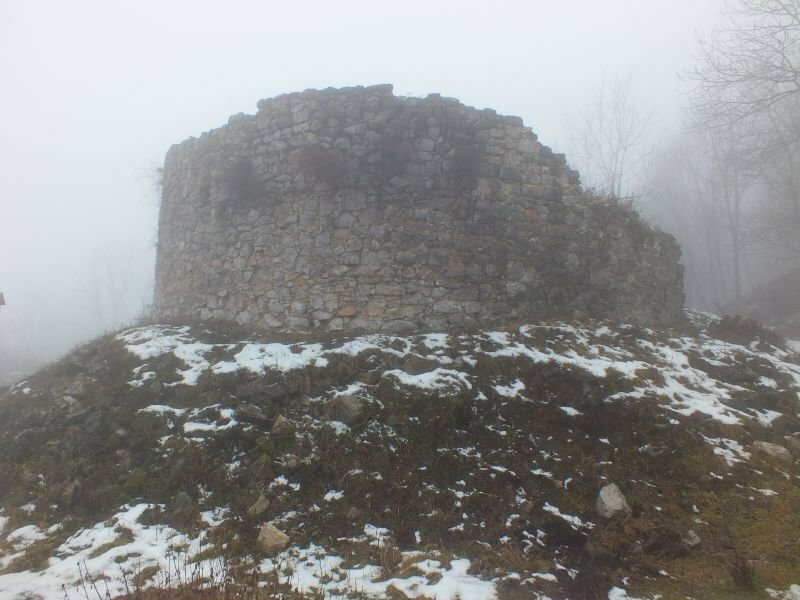 On the other hand, these walls were exposed to the weather conditions, mainly the winds which slowly removed the mortar from the wall, leaving loose stones on the top of the wall. 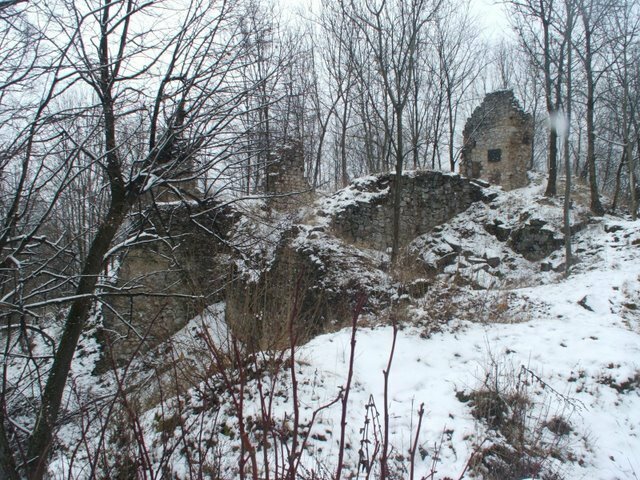 This is of course dangerous for the visitors and for the volunteers who are working under the walls to save the castle. Reinforcing the last of those remaining high walls was our greatest achievement at the end of last year. 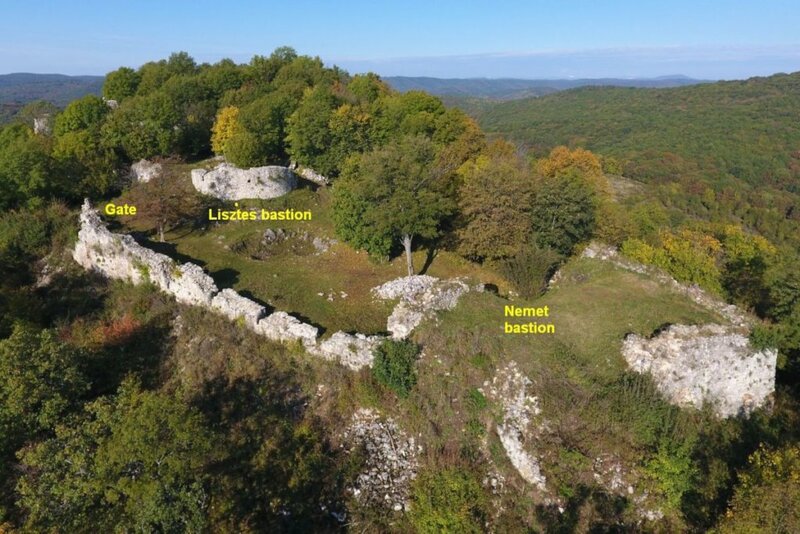 As mentioned in our previous report, this wall stands on the north side of the inner bailey between the Csonka (Truncated) bastion and the Konyha (Kitchen) bastion. Please see the photos for the results. 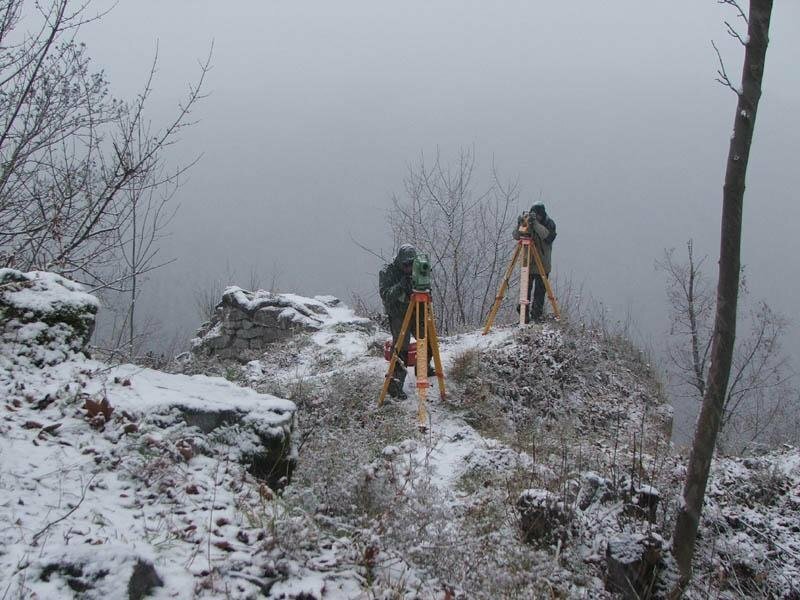 As every year, winter is about planning, reporting to authorities and preparing for the events of the year. We have paid a visit to the Herman Otto Museum in Miskolc to negotiate the conditions with the museum leaders for this year’s excavation week in the summer. We are also preparing for our next event, the Save the Castle days (March 15-16th). 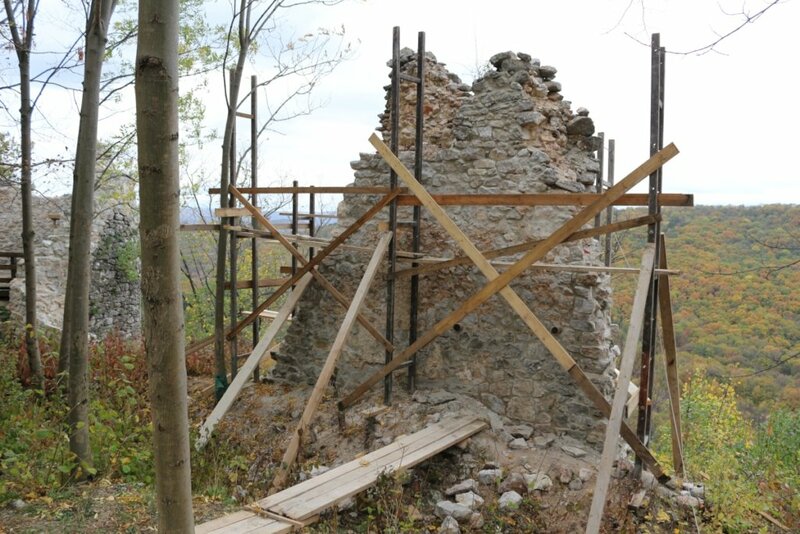 More changes are expected in Szadvar starting this year due to the National Castle program. That focuses mainly on the lower castle – which was almost completely excavated last year and it will partly be reconstructed. Only parts of the higher castle will be touched by the castle program though, due to the limited funds. So our work is still needed, volunteers can still contribute to keeping the castle in the current conditions and save it for the future. 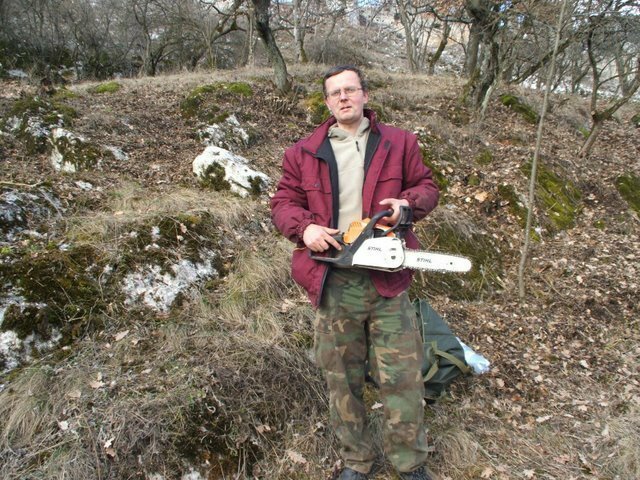 Also, since Szadvar is located in a far and poor part of the country, next to a small village, the long-term maintenance needs to be arranged and supported. Last year we were trying to find more volunteers in schools, reaching out to teachers and students around the country and mostly in the Szadvar area. We had received positive responses and many children appeared on our events. But we also wanted to understand what moves other people to help and do volunteer work. That led to the idea of creating a survey, shared over the social networks and on our homepage. It was responded by many people, too. This will help us to understand what we were doing good and which are the areas where we need to improve and put more effort. We have asked about our past events but also about potential new ones we could organize e.g. 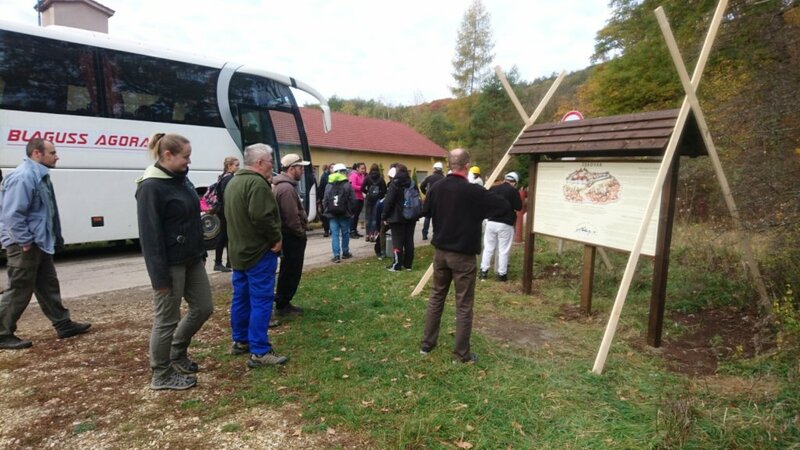 hiking competition, another Siege day etc. Of course we would not be able to reinforce walls, support excavations and organize events without your valuable donations. Let us proudly inform you about a record-breaking ‘Save the Castle’ days in October 2018. This fall, almost 60 people have decided to devote their long weekend and their spare time to help and join us. It was even more gratifying that 40 out of that 60 were high school students! 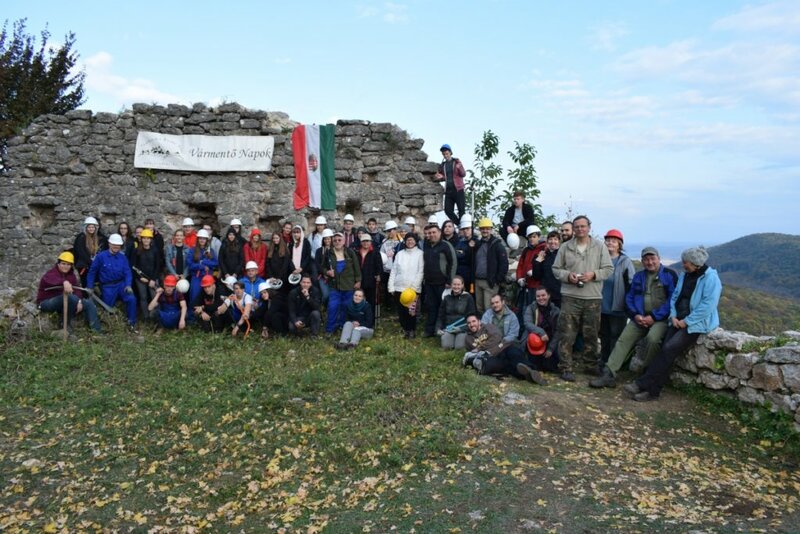 Hungary is not a big country, but it is still humbling to mention that most of the volunteers arrived from far reaches – from the cities Gyor (43!) and Pecs (2). 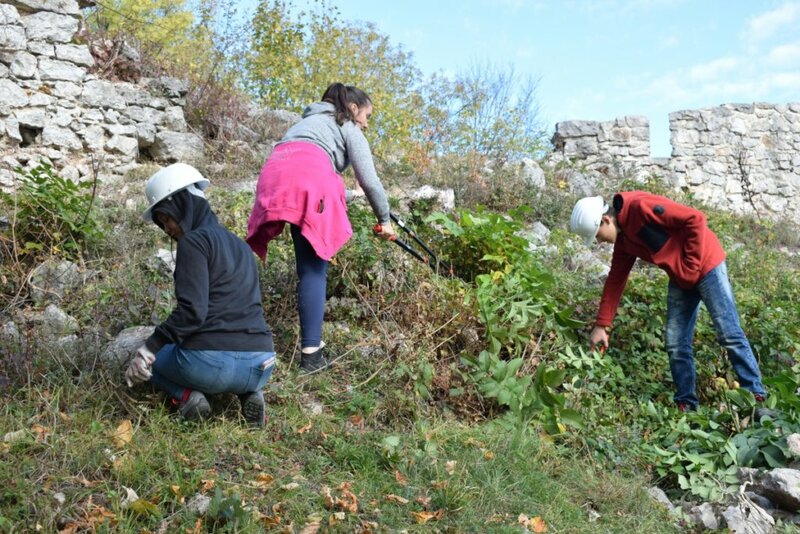 But regardless how far they came from, everyone was working hard cleaning the castle area from the growing vegetation and moving the stones close to the construction areas. We were able to spend two busy days working in the castle as this time the weather was perfect and supportive for our activities. Of course, we also found time to check out the results of the summer excavations. Several new details have been revealed including the entrance of the lower castle on the east side which was a complete surprise. It was not expected to be there as the medieval imageries showed it on the west side – where the wall has disappeared probably due to the water flows from the hill. 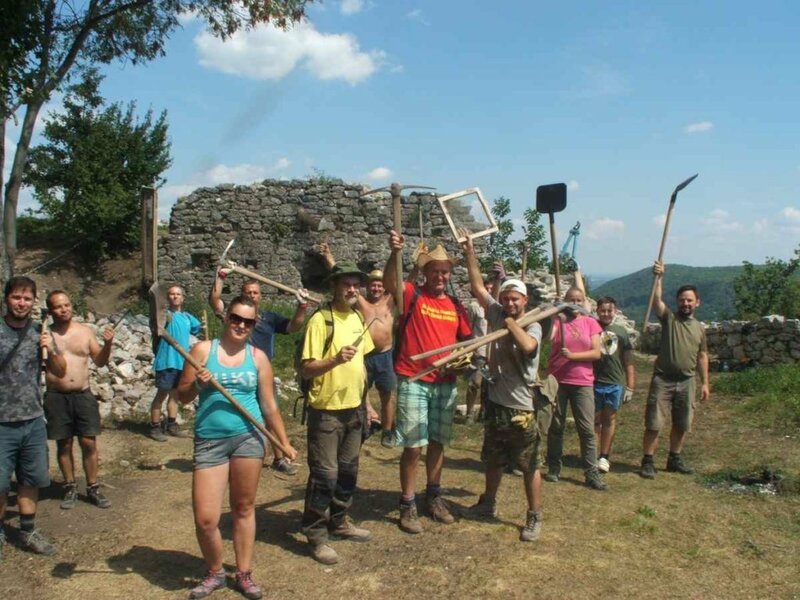 On top of the summer excavations we managed to initiate conservation works this year, too! 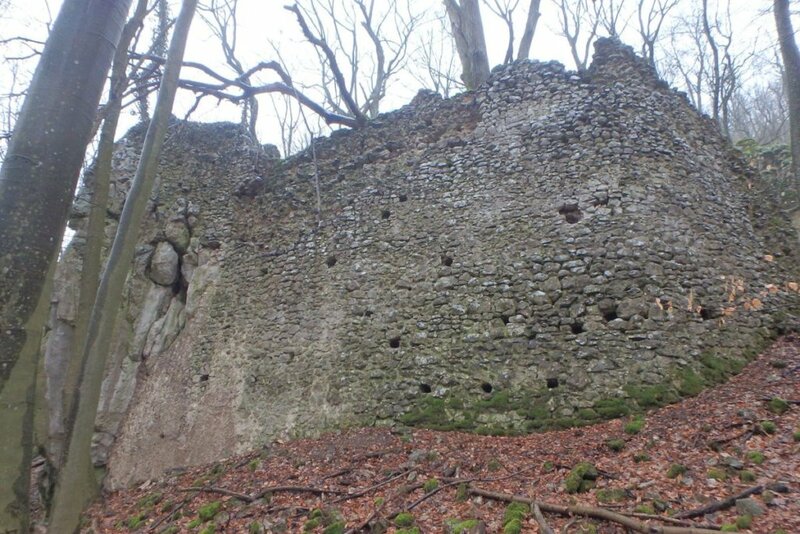 A section of the wall which is still standing high was considered a dangerous area for the visitors of the castle. 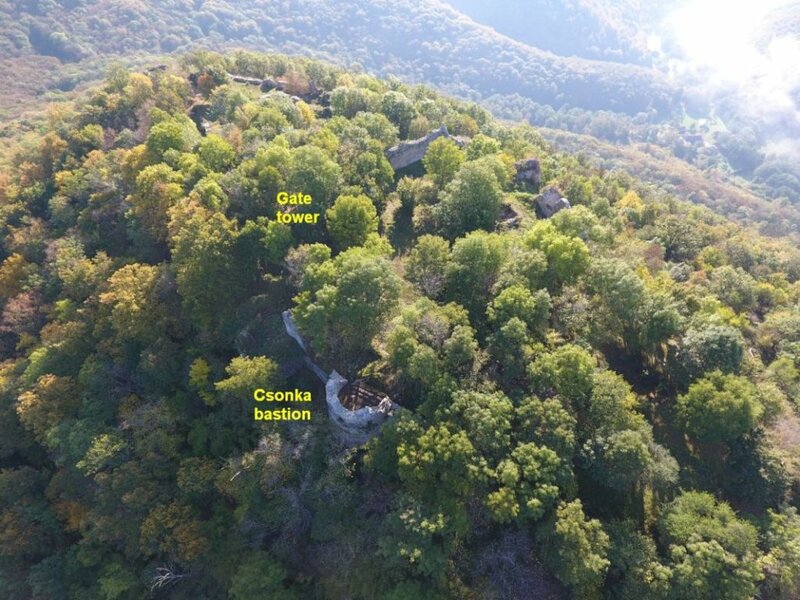 It is located on the north wall of the inner bailey - between the Csonka (Truncated) bastion and the Konyha (Kitchen) bastion. Using the funds we managed to gather, this remaining threat will have been eliminated by fixing and enforcing the wall structure. 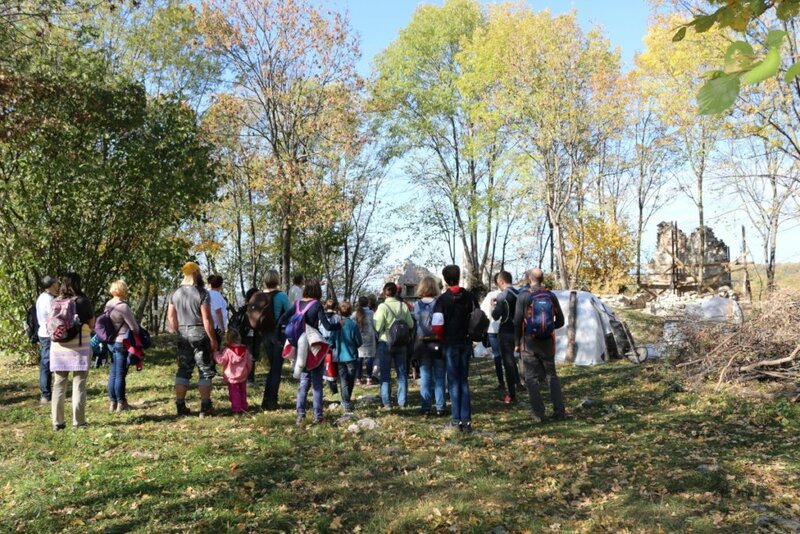 Friends of Szadvar were also invited to a conference held by the National Cultural Fund. Our organization was called upon to make a presentation about our activities in the last 12 years. It was a great honor for our president to stand in front of the architects and authorities who are responsible for the Cultural Heritage of Hungary and talk about the great achievements which have been done in Szadvar. As you must know, Thanksgiving is not celebrated in Hungary. But if it would, Friends of Szadvar would have a lot to give thanks for. We are thankful that there are people in the country who can share our passion and concern about the cultural heritage Szadvar represents. These unbelievable results could not have been realized without our supporters and volunteers. Thanks for all the help we were receiving from various people and organizations. And of course, we are grateful for the donations we receive from all over the world. 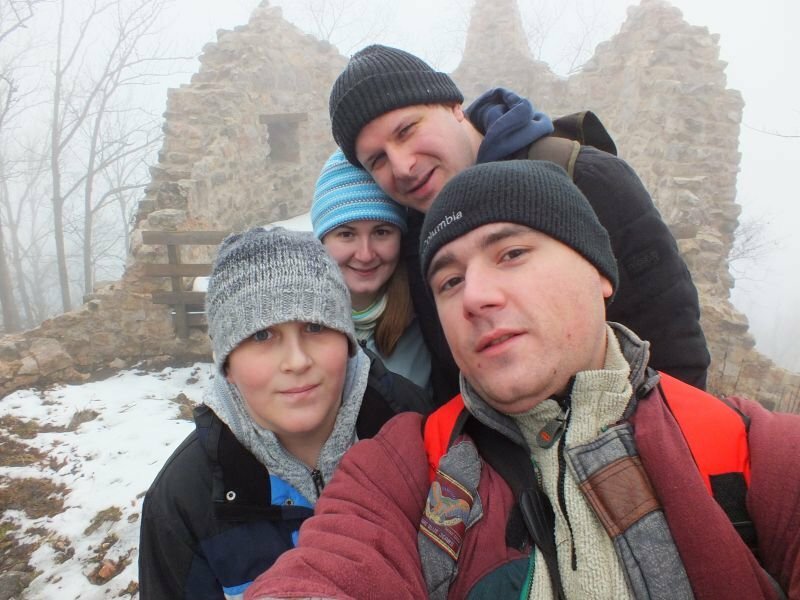 Szadvar is a perfect example of places which bring people together. Although it is just a ruin now, it still has the power of building a bridge between villages, other castles and even countries! 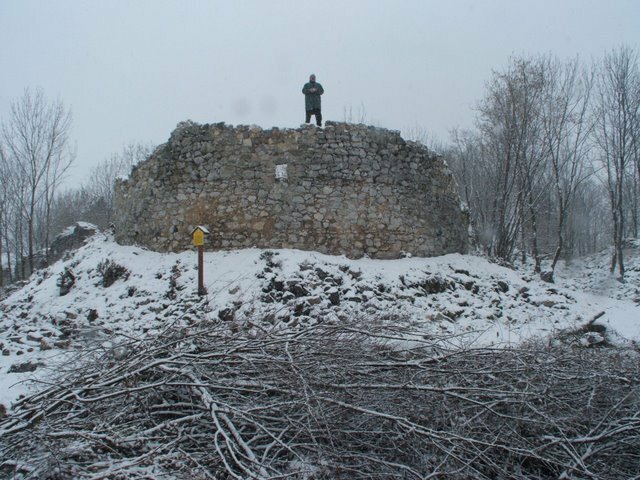 In the Middle Ages two noble castles stood high above this area of the Hungarian Kingdom. Today Szadvar is located in Hungary and Torna (Turniansky Hrad) is in Slovakia. The distance between them is just 10 miles but a borderline was drawn to separate them. But they are not separated anymore. Both buildings are ruins now and were meant to slowly disappear from the face of the Earth. 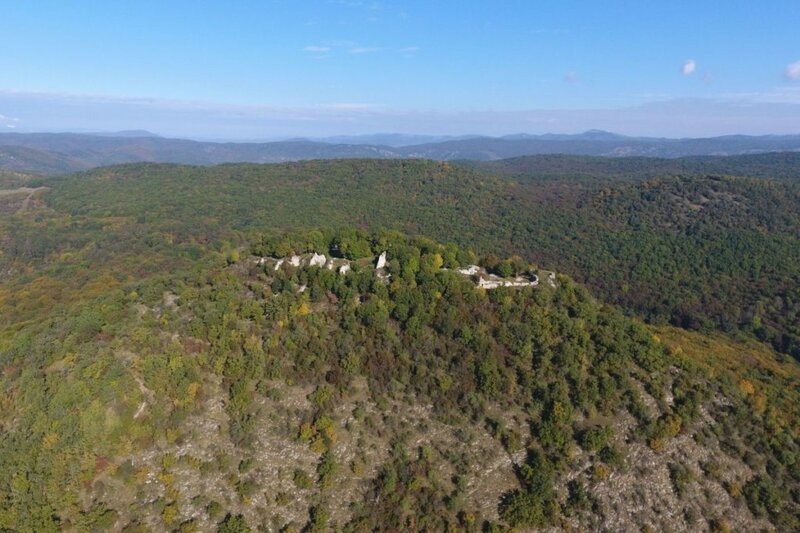 But just as Szadvar has got its saviors - Friends of Szadvar, the people of Torna have also founded an organization (Castrum Thorna Civil Partnership) and have been working for years to save the remains of that fortress for their grandchildren. This year the international collaboration between us reached the next level: the members of Castrum Thorna Civil Partnership have participated in our ’Save the Caste’ week. 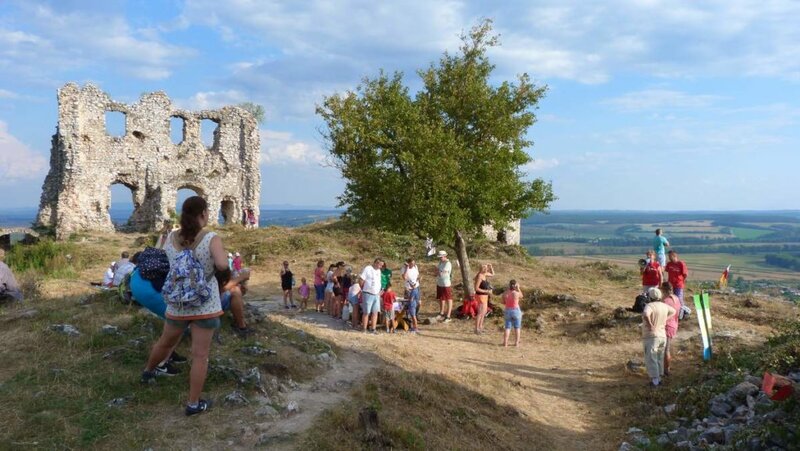 Similarly, we have participated in the ’Castles and Castle Ruins Night’ event on the other side of the border in Slovakia. As we have already proudly reported, our efforts were recognized this year by the Hungarian government by selecting Szadvar to support by the National Castle Program. This led to a longer and more extended excavation in the castle than ever before. This activity of course was controlled and driven by the responsible archeologists of the Herman Otto Museum. 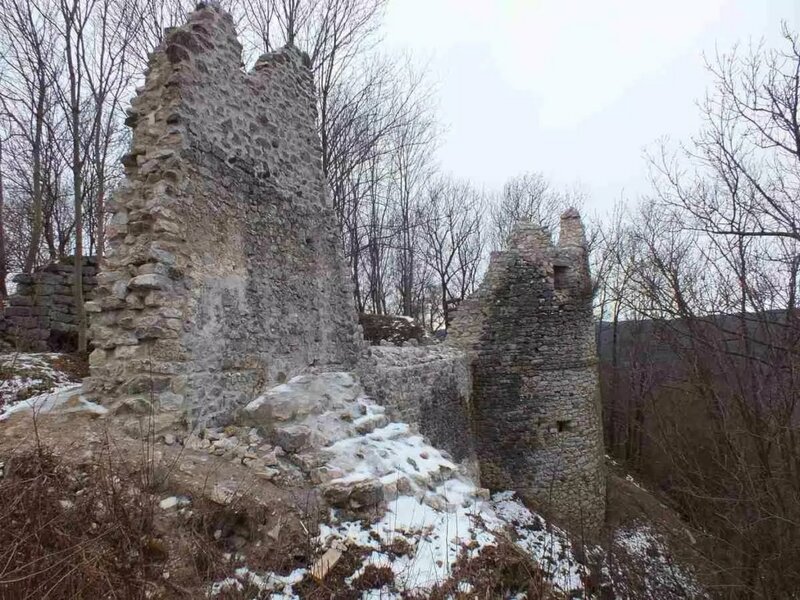 The goal of the program is to search, clean and conserve some of the more ‘interesting’ parts of the castle and create spectacular attractions which would bring more tourists to this hidden part of the country. Due to that, during the ‘Save the Castle week’ this year we had the opportunity to work not only in the upper castle but also in the lower fortress which was a surprisingly huge building and still has 40-50 feet high walls! It was once the fortified lower station of the ’csiga’ – a medieval elevator which had been used to pull water and wood and other supplies to the higher castle. It might have been a wooden ’railroad’ where a horse powered ‘dry mill’ was pulling a carriage from the lower castle. Traces of the wooden rail structure carved in the stone were found on the side of the castle hill. 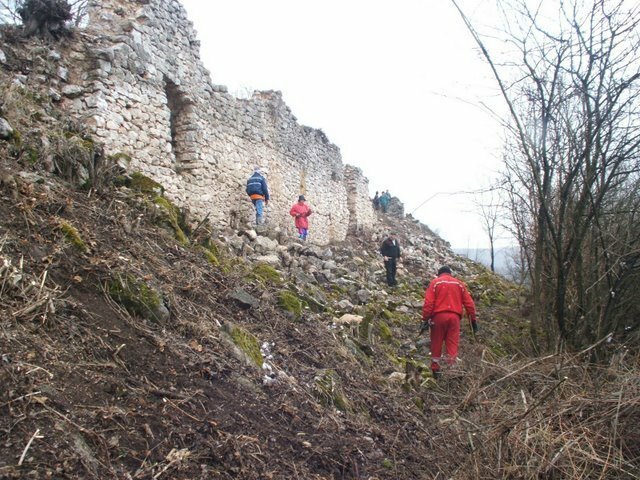 But most of the volunteers were working uphill, where four new excavation trenches were opened on the northern wall of the outer bailey (this is where the elevator used to arrive). Probably because of the National Castle Program there were many fresh faces among us. We were very happy because many young people became interested in saving a part of our cultural heritage. 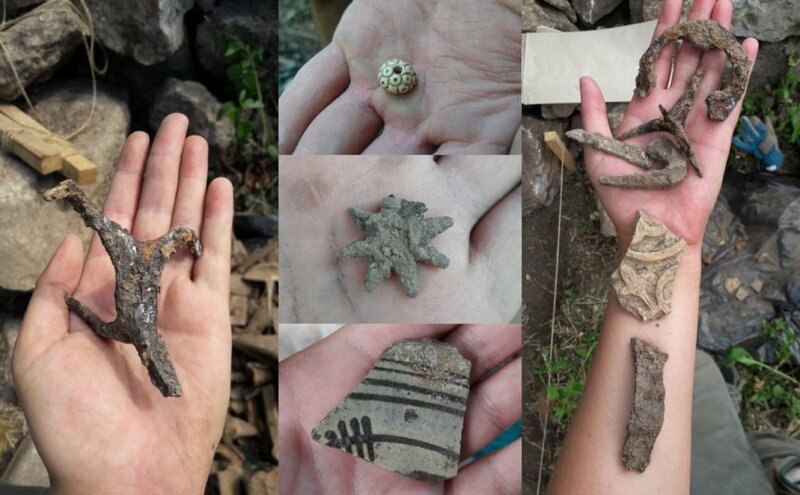 Everyone had an exciting time finding artifacts such as parts of ceramics, coins, musketeer bullets and other several hundred years old artifacts. The excavation and the conservation works will continue next year. We will keep you posted! 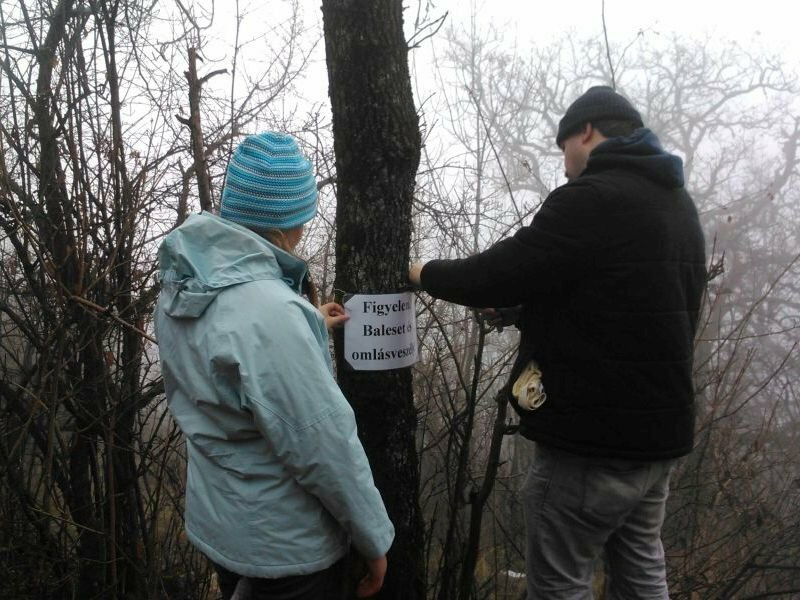 Please see some pictures from the events in Szadvar and in Torna (Slovakia). Both events were wonderful experience and we are sure that this collaboration will be fruitful for both castles and for the people dedicated to save them. 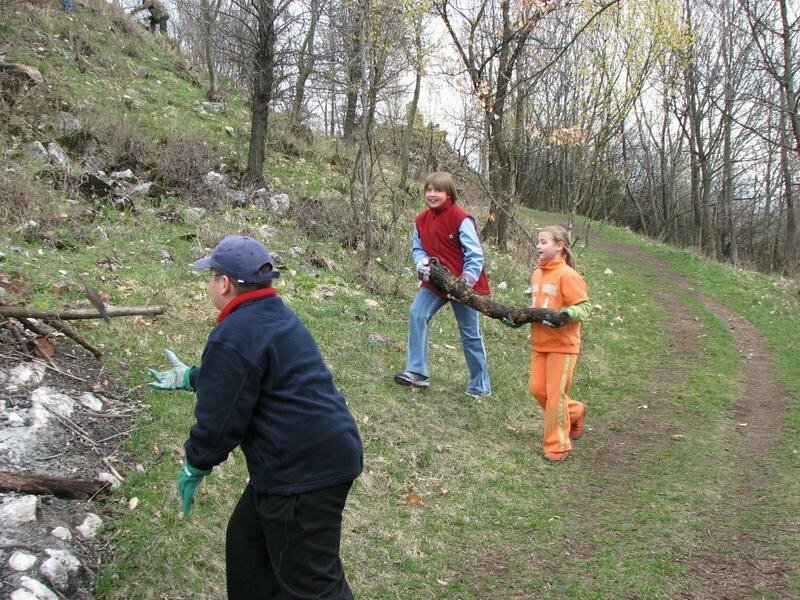 Our events, like the ‘Save the Castle’ days (March 16-17th) are of course outdoor activities. You cannot save a castle just sitting inside the living room, can you? But that also means weather is a key factor in the success. And this time it was a disaster. Heavy rains and even snow was forecasted for the weekend. 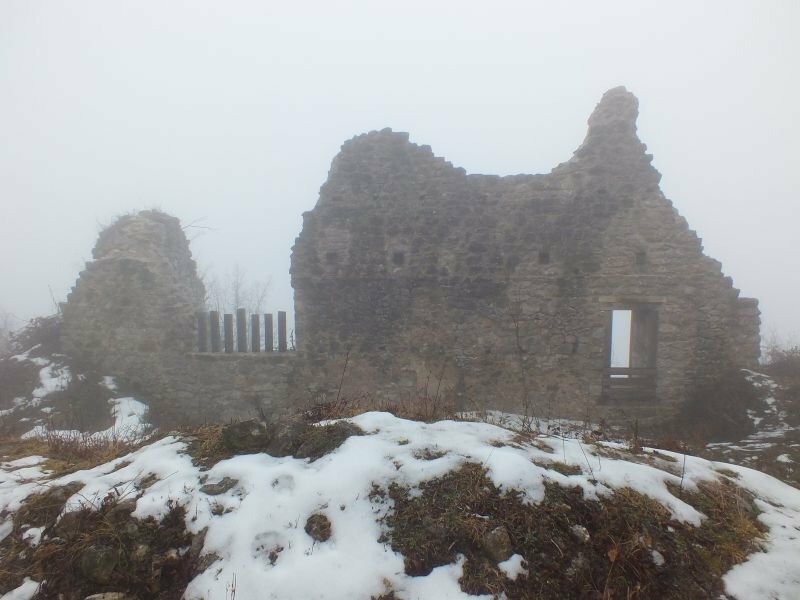 Despite that many of us have travelled to Szögliget to meet the team and to breathe in the fresh air and take some walks in the forest and even up in the castle. But there was no opportunity to do much. We will have to take care of the cleaning of the castle in the summer. 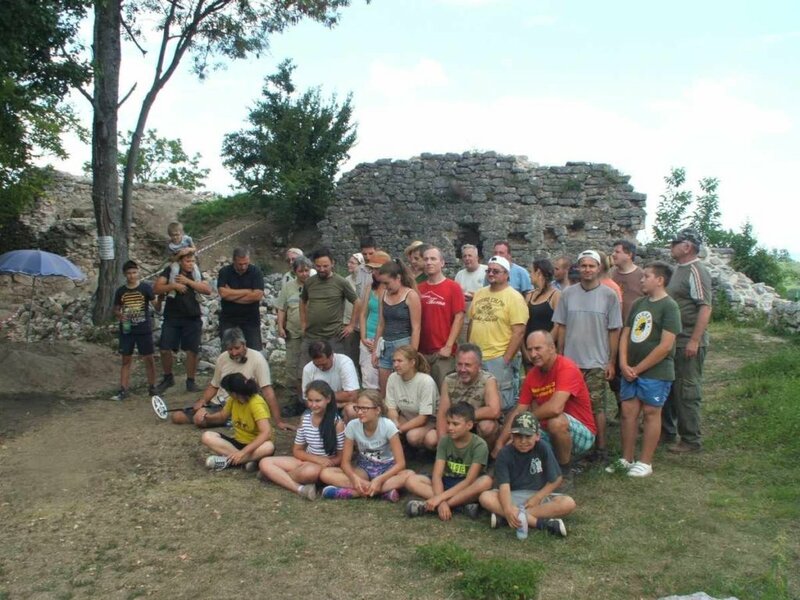 On the other hand, it was great news that Szadvar was selected to be supported by the National Castle Program. This is a great achievement for the Friends of Szadvar, too. Without the hard work made there in the last 11 years it surely would not have got the attention from the politicians - who now decided to help this far and hidden part of the country. That also means that much more extended excavations will take place this year than ever before. The whole fortification will still not be revealed. That would take much more money and time. But at least certain points of the castle will be dug out and preserved. The lower castle – which once was the lower point of the horse powered elevator in the castle. See the attached layout and pictures showing the places. 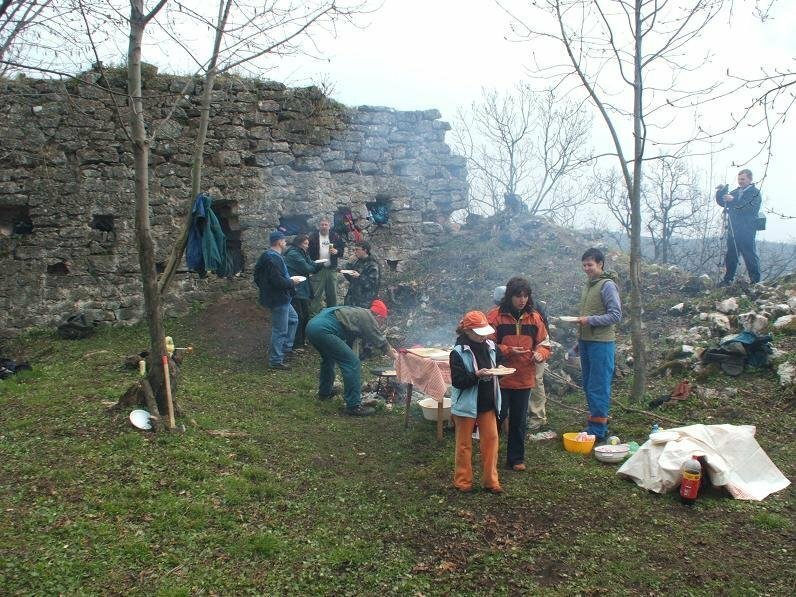 Of course, we will join to the excavations for one week with volunteers and try to help as much as possible. It was also made clear that after the Castle Program ends we need to maintain our activities. The status of the castle does not change. This is a significant help in our job, but it does not end here. 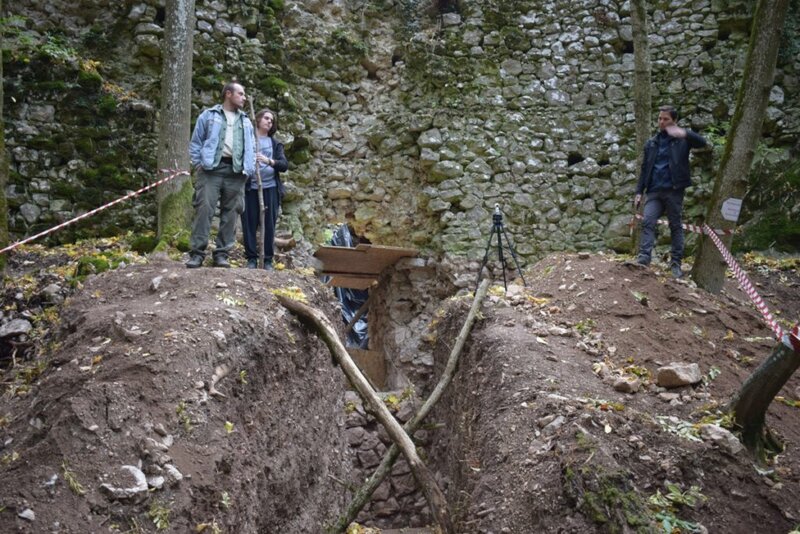 The archeologists say we still have enough secrets to find in Szadvar for the next 100 years. We hope you will continue with us on that journey. Szadvar has not been saved yet! It is usually an eventless period of the year, but recently we have a lot going on. 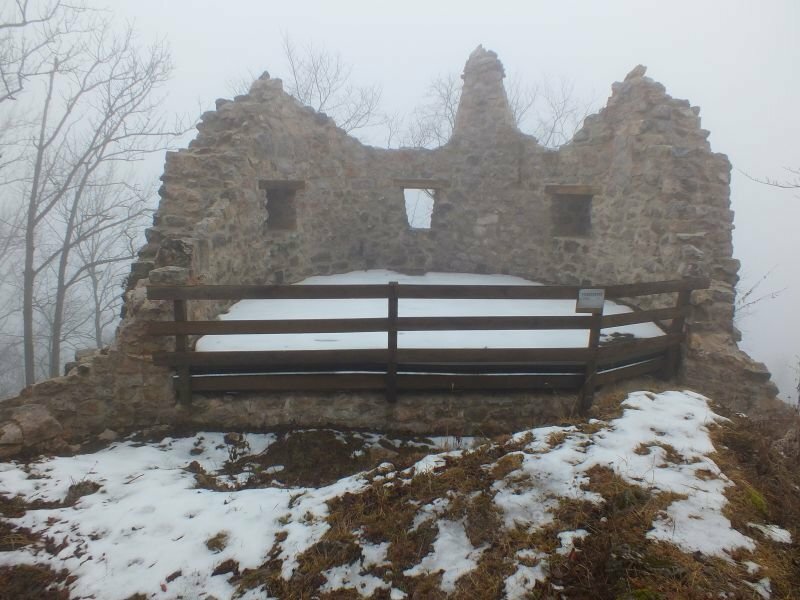 The warning signs we had planted around the ruins are important due to the growing numbers of hikers and tourists coming to Szadvar. Unfortunately, these signs wear down quickly. So far we could not find a more permanent weather-proof solution, so we have to replace them every other year. This can be done at this time, when other activities can’t. Of course, the castle is hiding in the fog and covered by snow. It has a completely different atmosphere this time. Please see the attached photos (by Tamas Grecmajer, Janos Dobos). Our next event, the Save the Castle days (March 16-17th) is under preparation now. 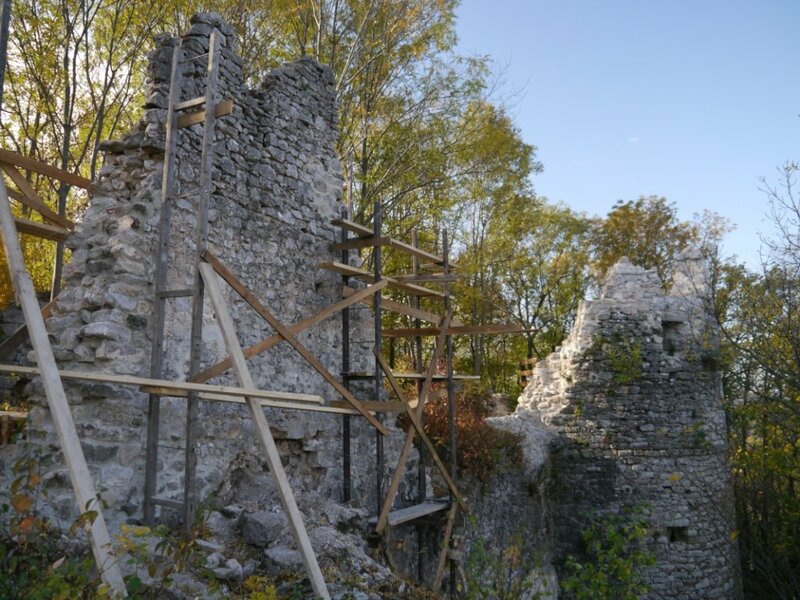 The plan is to work on the spots of the castle which will most probably be examined during the archeology week in the summer (July 30th – August 4th). 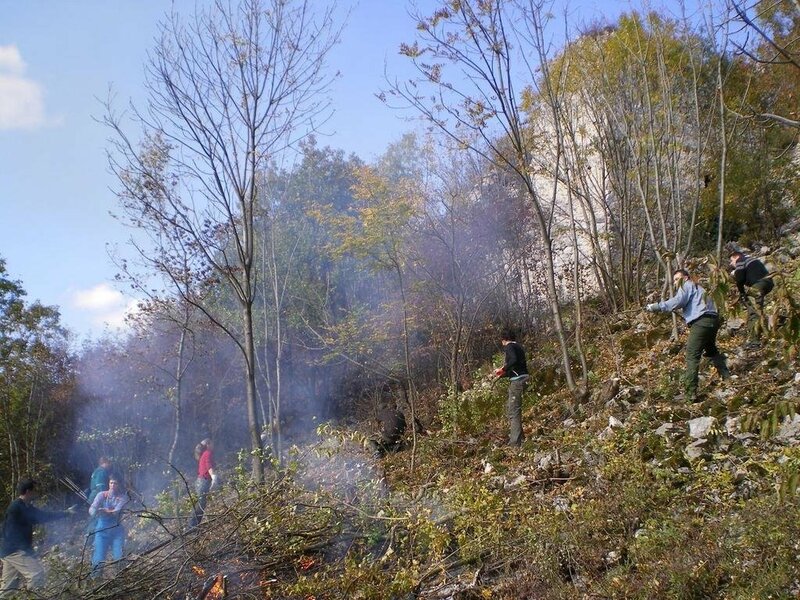 We will clean the area of the weeds and bushes and collect the loose stones from the areas and pile them. 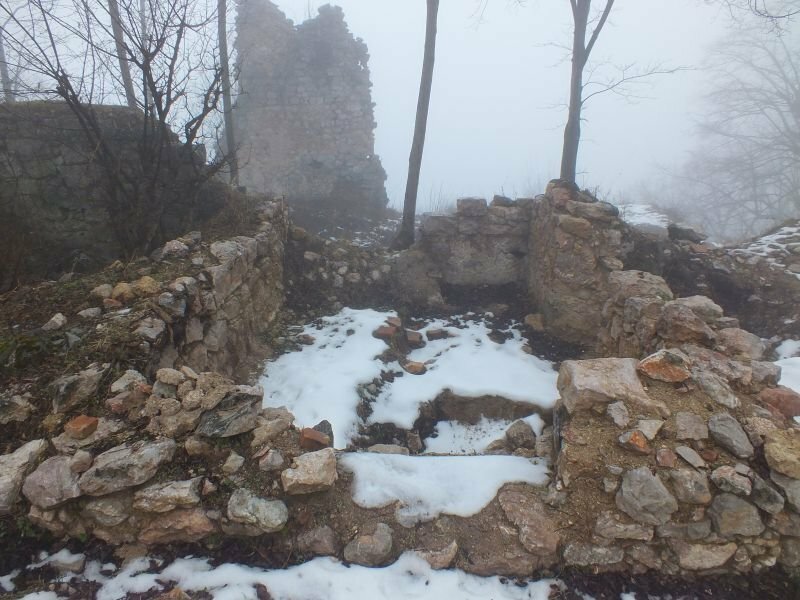 It gets harder and harder to find volunteers to come to far reaches of the country and work hard to save the ruins of Szadvar. But we have some positive examples, e.g. there are students coming regularly from a high school at the city of Gyor - which is very far from the castle. So now we are contacting other high schools in the country, mostly from the region of Szadvar and try to make the teachers and the young people aware that Szadvar is there and we can still save it for the future, for them. We are also updating our publications to re-issue them. It is also essential that we can show the achievements and the results of the hard work and the help we received from our volunteers.